I have recorded and posted WM 99: Cyril of Alexandria. You can listen here. St. Cyril of Alexandria, On the Unity of Christ, trans. and introduction by John Anthony McGuckin (St. Vladimir’s Press, 1995): 151 pp. Cyril of Alexandria (378-444) was the nephew of Theophilus, bishop of Alexandria from 385-412. Upon the death of Theophilus in 412, Cyril, at age 34, became his uncle’s successor. He clashed with Nestorius, bishop of Constantinople over the unity of the person of Christ and the orthodoxy of the title theotokos (“God-bearer”) for Mary, which Cyril supported and Nestorius opposed. This led to the second ecumenical Council at Ephesus in 431, which upheld Cyril’s views and denounced those of Nestorius. Philip Jenkins says Cyril was both “a brilliant thinker” and “an obnoxious bully” (Jesus Wars, p. 58). One of the darkest marks against him in Alexandria was his role in the death of a noted pagan woman philosopher named Hypatia in 415. He also used his political power and muscle to depose Nestorius and send him into exile. His stress on the one person of Christ was distorted by Dioscuros, his successor at Alexandria, in the so-called “Gangster Synod” or “Robbers’ Council” at Ephesus in 449 which declared one nature of Christ. This “one nature” view (or the monophysite view, from the Greek physis, nature) had been championed by Eutyches (c. 375-454). David Bentley Hart summaries this view: “in the Incarnation, Christ’s humanity was wholly assumed into his divinity” (The Story of Christianity, 126). This meeting was dubbed the second council of Ephesus but due to its errant christology it is not accepted by the orthodox among the great early ecumenical councils. In later church councils, most notably at Chalcedon in 451, a more balanced and well-defined orthodox Christology was articulated which declared Christ to be one person with two natures (true man and true God; the diophysite view). The monophysite view, however, continued and continues to be held in the so-called “Oriental” churches (the Coptic Church of Egypt, the Ethiopian Church, the Syrian Jacobite Church, and the Armenian Church). 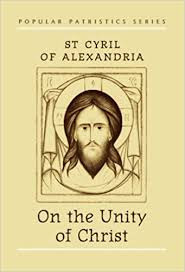 Cyril’s book On the Unity of Christ (Greek title: Ho heis ho Christos) was composed toward the end of his life and long after the conflict with Nestorius. It reflects Cyril’s mature views on Christology. The book uses a hypothetical dialogue format with questions on Christology posed and answered. See this post on how the reflections of Cyril likely influenced WCF/2LBCF (1689) 10:3. Citations below are from the edition translated and introduced by John Anthony McGuckin and printed in the “Popular Patristics Series” from St. Vladimir’s Press. “It follows, therefore, that He Who Is, The One Who Exists, is necessarily born of the flesh, taking all that is ours into himself so that all is born of the flesh, that is us corruptible and perishing beings, might rest in him. In short, he took what was ours to be his very own so that we might have all that was his” (p. 59). “For God was in humanity. He who was above all creation was in our human condition; the invisible one was made visible in the flesh; he who is from the heavens and from on high was in the likeness of earthly things; the immaterial one could be touched; he who is free in his own nature came in the form of a slave; he who blesses all creation became accursed; he who is all righteousness was numbered among transgressors; life itself came in the appearance of death” (p. 61). “We must admit, of course, that the body which he united to himself was endowed with the rational soul, for the Word, who is God, would hardly neglect our final part, the soul, and have regard only for the earthly body. Quite clearly in all wisdom he provided for both the soul and the body” (p. 64). “…if our opponents insist that the holy virgin must never be called The Mother of God, but Mother of Christ instead, then their blasphemy is patent, for they are denying that Christ is really God and Son” (p. 64). “Come, let us investigate the divine and sacred scripture and let us seek the solution there” (p. 72). “How wicked they are, then, when they divide in two the one true and natural Son incarnated and made man, and when they reject the union and call it a conjunction” (pp. 73-74). “Well, Godhead is one thing, and manhood is another thing, considered in the perspective of their respective and intrinsic beings, but in the case of Christ they came together in a mysterious union without confusion or change. The manner of this union is entirely beyond conception” (p. 77). “My friend, if anyone says then when we speak of the single nature of God the Word incarnate and made man we imply that a confusion or mixture has occurred, then they are talking utter rubbish” (79). “It was not impossible to God, in his loving-kindness, to make himself capable of bearing the limitations of the manhood” (p. 79). “He lived as a man with earthly beings, and came in our likeness, but he was not subject to sin like us, but was far beyond the knowledge of any transgression. The same was at once God and man” (p. 89). “…if someone has another added to him he cannot be considered one. How could he be? He would be one plus one, or rather one plus something different, and without question this makes two” (p. 91). “So, even if he is said to suffer in the flesh, even so he retains his impassibility insofar as he is understood as God” (p. 117). “In his own nature he certainly suffers nothing, for as God he is bodiless and lies entirely outside suffering” (p. 121). “The Word remained what he was even when he became flesh, so that he who is over all, and yet came among all through his humanity, should keep in himself his transcendence of all and remain above all the limitations of the creation” (p. 129). “He suffers in his own flesh, and not the nature of the Godhead” (p. 130). “No, as I have said, he ought to be conceived of as suffering in his own flesh, although not suffering in any way like this in the Godhead” (p. 130). Cyril of Alexandria was certainly not a perfect man. He was a very flawed man, in the providence of God he was used to articulate an orthodox view of Christology, especially by stressing the oneness of Christ. Though some of his views were distorted by Eutyches and the monophysites, that too was, in God’s providence, corrected. We are less familiar with Cyril but we see his views reflected in our Protestant orthodox confessions.